In what ways could the grouping of regions made here be seen as misleading? Watch the video below and add data and illustrations to a world map, using different colour pens. Population growth rate indicates the percentage change of resident population compared to the previous year. Subtracting the crude death rate from the crude birth rate provides the rate of natural increase, which is equal to the rate of population change in the absence of migration. Crude death rate indicates the number of deaths occurring during the year, per 1,000 population estimated at midyear. Calculate the natural increase for each of the world regions in 2016 using data from the graphs above. Life expectancy is the average number of years a newborn is expected to live with current mortality patterns remaining the same. Fertility rate is the average number of births per woman. With reference to named regions and data, describe the relationship between life expectancy and fertility rate for all subregions between 1976 and 2015. The dependency ratio is an age-population ratio of those typically not in the labor force (the dependent part ages 0 to 14 and 65+) and those typically in the labor force (the productive part ages 15 to 64). It is used to measure the pressure on the productive population. Consideration of the dependency ratio is essential for governments, economists, bankers, business, industry, universities and all other major economic segments which can benefit from understanding the impacts of changes in population structure. A low dependency ratio means that there sufficient people working who can support the dependent population. A lower ratio could allow for better pensions and better health care for citizens. 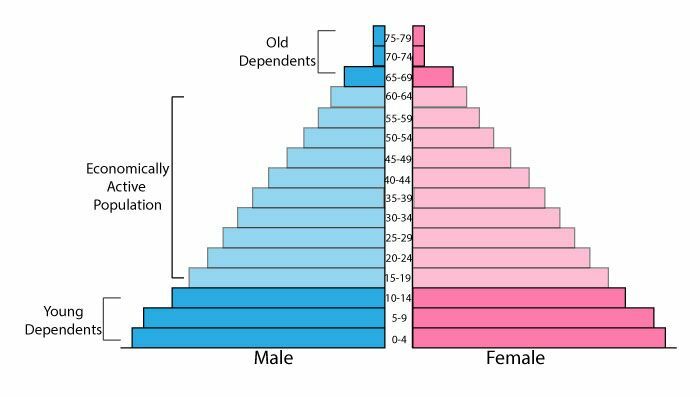 Total age dependency ratio is the ratio of dependents (< 15 and > 64) to the working-age population (15-64). The youth dependency ratio is the population ages 0-15 divided by the economically active population ages 16-64. The old-age dependency ratio is the population ages 65-plus divided by the economically active population ages 16-64. We are going to investigate population and health data for two contrasting countries. Create a document describing and explaining demographic data for Switzerland and Niger. Create graphs from the World Bank data set and write a brief paragraph which describes the graphs with reference to data, then explain the trends. 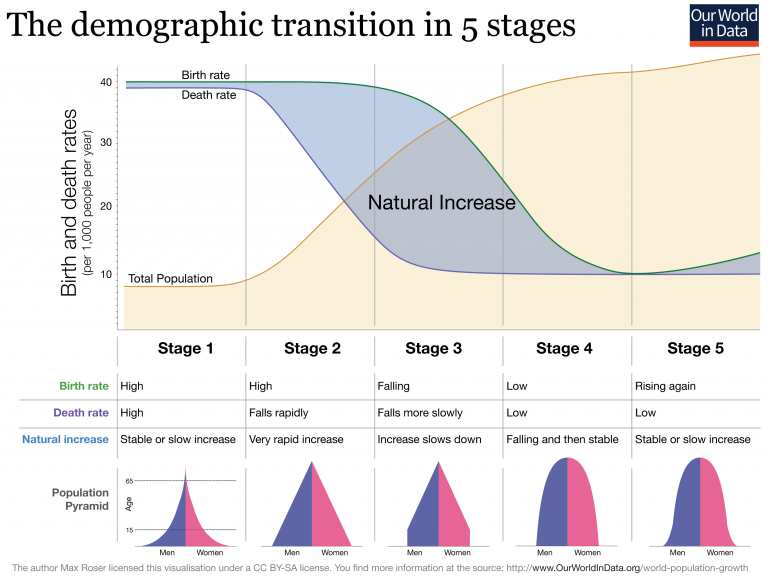 Include a population pyramid for each country from populationpyramid.net as well as a graph showing demographic transition. Each of these should be incorporated into the document and commented on, with reference to the data you have collected. Access the World Bank Development Indicators web page. Country: select Switzerland, Niger and one middle income country of your choice. Download the data as an Excel file. Cleanse the data by removing unnecessary columns. Read the two articles below and incorporate information from these into your document. Outline the demographic challenges faced by both countries. 2007 was the first year in human history when more than 50% of the world's population lived in urban areas. Urbanisation is happening at a faster rate than at any time in human history. Asia accounts for over half of today's megacities. By 2030 nearly 9% of the world's population will live in 41 megacities, with India and China having 7 megacities each. It is predicted that Africa will have some of the highest rates of urbanisation in the future. While European and North American megacities show limited growth, megacities in developing economies continue to grow rapidly. Africa's population is expected to double by 2050, reaching 2.5 billion people. You represent a marketing and investment firm in Lagos. Create a presentation encouraging large transnational companies (TNCs) to invest in Lagos. While you should highlight the specific issues that Lagos faces, the main focus should be on the positive changes that occurring. Introduce Lagos as a site for potential investment. Include images, a map and data. 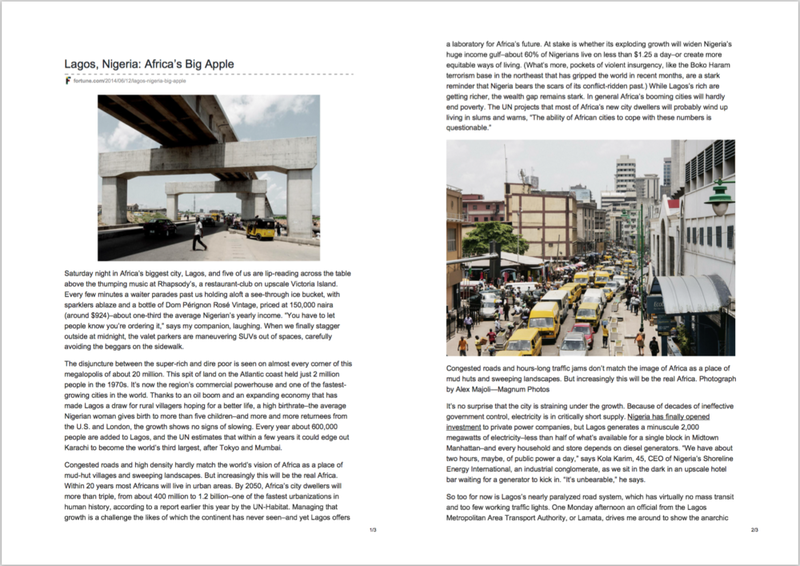 Outline the main issues Lagos is facing, including reference to specific named places. estimated at 25.9 million - 10.1% of all international migrants. What were the three main causes of this? Watch the video below to find out. Forced migration refers to the movements of refugees and internally displaced people (those displaced by conflicts) as well as people displaced by natural or environmental disasters, chemical or nuclear disasters, famine, or development projects. Development induced displacement people forced to move due to large scale infrastructure projects e.g. dams, airports, roads, mining, deforestation or conservation. 10 million people a year are displaced due to dam constructions. The 3 Gorges Dam in China displaced 1.25 million people. Disaster-induced displacement people forced to move due to natural disasters such as volcanoes, hurricanes, landslides, environmental change (global warming) and human induced disasters such as the release of radiation and chemicals. Asylum seekers: people who have moved across an international border in search of protection under the 1951 Refugee Convention, but whose claim for refugee status has not yet been determined. Annual asylum claims in Western Europe, Australia, Canada and the USA combined rose from some 90,400 in 1983 to 323,050 in 1988 and then peaked at 828,645 in 1992. Refugee: a person residing outside his or her country of nationality, who is unable or unwilling to return because of a ‘well-founded fear of persecution on account of race, religion, nationality, membership in a political social group, or political opinion’. Development displacees: people who are forced to move as a result of development projects. These include large-scale infrastructure projects such as dams, roads, ports, airports; urban clearance initiatives; mining and deforestation; and the introduction of conservation parks/reserves and biosphere projects. Affected people usually remain within the borders of their country. 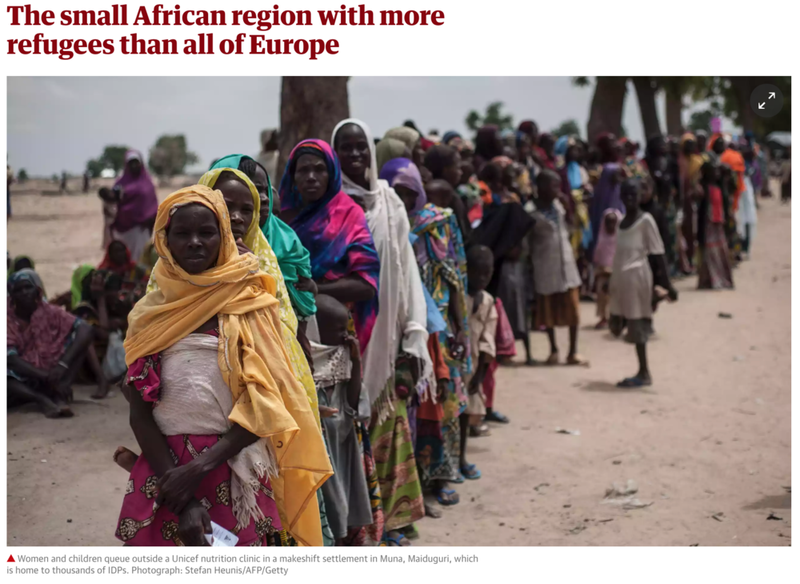 It has been estimated that during the 1990s some 90 to 100 million people around the world were displaced as a result of infrastructural development projects. 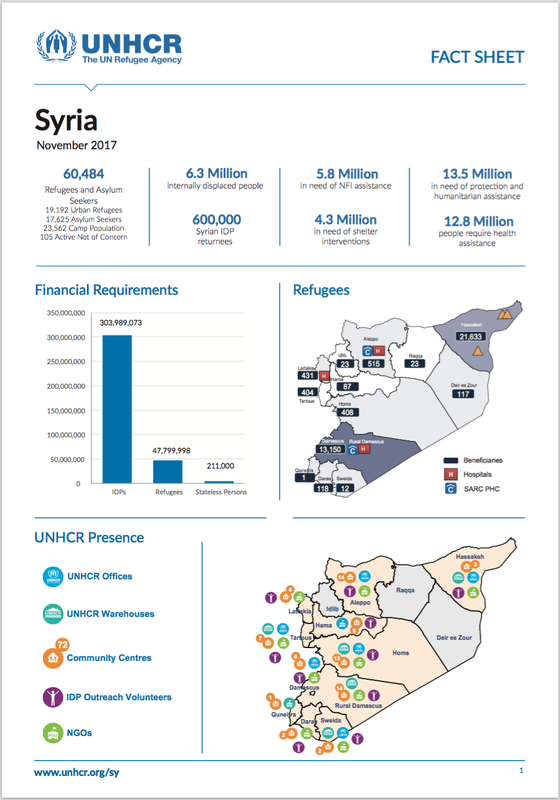 Internally displaced people: people who have been forced to flee their homes suddenly or unexpectedly in large numbers, as a result of armed conflict, internal strife, systematic violations of human rights or natural or man-made disasters, and who are within the territory of their own country. There is no specifically-mandated body to provide assistance to IDPs, as there is with refugees. Smuggled people: migrants who are moved illegally for profit. They are partners in a commercial transaction. This is not to say that the practice is not without substantial exploitation and danger. People who think they are being smuggled may run the risk of actually being trafficked. Environmental and disaster displacees: sometimes referred to as ‘environmental refugees’ or ‘disaster refugees’, in fact most of those displaced by environmental factors or disasters do not leave the borders of their homeland. This category includes people displaced as a result of natural disasters (floods, volcanoes, landslides, earthquakes), environmental change (deforestation, desertification, land degradation, global warming) and human-made disasters (industrial accidents, radioactivity). Trafficked people: people who are moved by deception or coercion for the purposes of exploitation. The profit in trafficking people comes not from their movement, but from the sale of their sexual services or labour in the country of destination. The trafficked person may be physically prevented from leaving, or be bound by debt or threat of violence to themselves or their family in their country of origin. Create a shared document summarising political causes & the effects on people and places. Include a summary of facts and data, maps, graphs and a video. Create a shared document summarising enviornmental causes & the effects on people and places. Include a summary of facts and data, maps, graphs and a video. 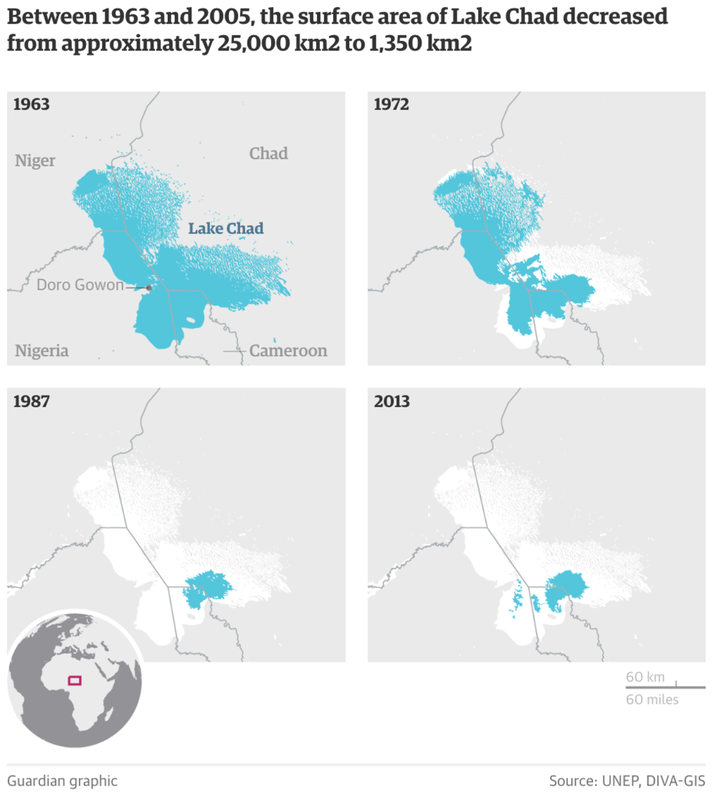 Climate change and the dessication of Lake Chad is seen as one reason for increasing religious extremism in Borno State, Nort-East Nigeria.